Benguet is most well-known among mountain climbers and outdoor adventurers as home to Mt. Pulag, the third highest mountain in the Philippines. However, there's another mountain in the province that is quickly growing in popularity as a climbing and hiking destination. It's called Mt. Ulap and one of the major reasons why people are trooping to the mountain is the fact that it's very near Baguio City. It's about 45 minutes away by jeepney. The trek alone is a one-day hike (back and forth). Experienced hikers and climbers can complete the full trail in an hour or two. For beginners, the trek can take them between two to six hours. The trail measures about 8.5 kilometers. Actually, the name Mt. Ulap is sort of a misnomer because the Mt. Ulap traverse will get you through several hills and mountain peaks. With that said, it's a combination of uphill and downhill climbs. You will reach the highest summit near the end of the eco trail. Most of the time, you will be hiking though slopes covered in grass. The trail is tricky at times so make sure that you have with you a good and sturdy pair of hiking shoes or boots. A lot of people are asking about the difficulty of the traverse. It's an easy climb if you are an experienced mountain climber. If you are a beginner, some parts of the trail can cause you a little bit of trouble. Most of those doing the traverse are beginners. If they can, then you can as well unless you have a medical condition that can cause you problems during the trek. 1) 45 minutes from Baguio City to Ampucao, Itogon. If you don't have your own car, there's a jeepney terminal along Lakandula Street. Fare is 35 pesos. You can also hire a taxi for the day. The driver will take you to Ampucao then fetch you at the end of the trail at Sante Fe when you finish the hike. It's up to you to talk with the driver about how much you are going to pay him for his services. 2) 1 to 6 hours from the entry point in Ampucao to the exit point in Santa Fe. As mentioned earlier, the number of hours it will take you to complete the trail depends on your experience as a climber. 3) 1 hour from the exit point in Santa Fe back to Baguio City. Jeepney fare is 50 pesos. The Ampucao, Itogon jeep terminal is located along Lakandula Street. If you are new in Baguio City and you have no idea where this street is located, it's best that you hail a cab and tell the driver to take you to Lakandula Street, specifically the terminal for jeeps going to the town of Itogon. The Ampucao jeep station is just beside Jollibee and Center Mall. 1. Take a jeep from Baguio City to Ampucao. Fare is 35 pesos. 2. Visit the Ampucao barangay hall to register. When I visited the mountain last January, I was directed to the gymnasium at the Ampucao Elementary School where a table was set up and manned by barangay officials. At the registration table, you will only be required to write your name, age, and address. Keep in mind that you will not be allowed to climb Mt. Ulap if you did not register. You can't DIY (do it yourself) the trek because hiring a guide is mandatory. 3. Pay the registration fee of 100 pesos (per head). 4. Secure a tourist guide. This will cost you 400 pesos. Whether you are alone or in a group, the tourist guide fee of 400 pesos remains the same. Each guide can accommodate up to 10 people. 5. Start the trek. The first part of the trek is an uphill climb through slopes thick with pine trees. 6. Climb several mountain peaks. The highest of the peaks is near the end of the trek. Along the way, you will pass by Gungol Rock, a rock formation which is without a doubt the most photographed section of the trail. Majority of the Mt. Ulap pictures you can find online feature the Gungol Rock, particularly the section of the formation that strategically sticks out into the sky. You will also pass through the beautiful Philex Ridge. 7. Visit the burial caves. You will pass by the burial caves on your way down the mountain towards the exit point in Santa Fe, Itogon. 8. Arrive at the exit point in Santa Fe. You can rest there for a while and have a snack. There's a small store as well as a souvenir shop at the end of the trail. 9. Go down to the highway and wait for your jeepney ride back to Baguio City. The fare will cost you 50 pesos. The ride back to Baguio City will take about an hour. For group travelers, the budget would be less for each of them because they are going to split the guide fee of 400 pesos among themselves. For instance, if you are traveling in a group of four, you are going to contribute only 100 pesos for the guide fee. Yes, the barangay allows hikers to set up tents and camp at the mountain. There's a designated campsite which is located just below the traverse's highest peak. You can set up your tents and camp there. You have to inform the barangay officials during your registration that you are going to camp at the mountain. You will have to pay a fee of 800 pesos and a guide fee of 500 pesos. You have two options if you plan on climbing Mt. Ulap. You can go there on your own or with a group of friends. Or you can go there though a travel package being offered by a travel and tours agency. If you reside within Baguio City or nearby areas, it would be better to go there without availing of a tour package. It would be less expensive for you or your group. However, if you are from far-flung areas like Manila, availing of a tour package would be a good idea. Mt. Ulap is often described as a mini-Pulag. Pulag has a height of 2,922 meters above sea level. Ulap's height is 1846 meters above sea level. Ulap also has its own sea of clouds. It may not be as majestic as Pulag's but it's beautiful in its own way. One advantage of Ulap is that you can go there, climb it, and be back in Baguio City within a single day. If you are going to climb Pulag, you have to put aside at least two days. Climbing Pulag would be a lot more expensive as well. Mt. 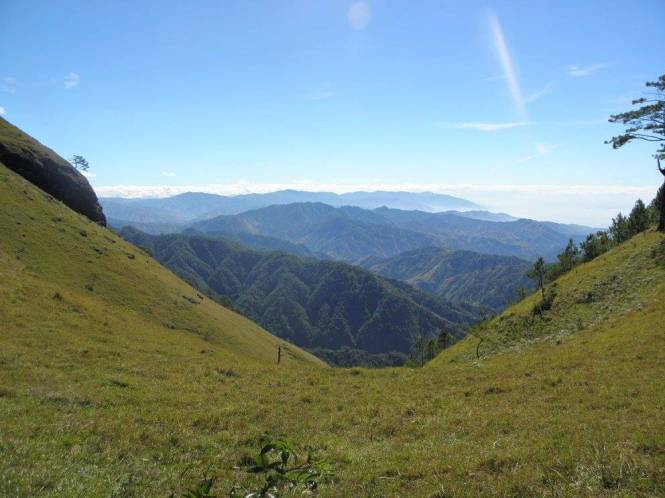 Ulap has an elevation of 1,846 meters above sea level (MASL). As to the weather and temperature, it's basically the same as that of Baguio City. You can find a lot more information about Mt. Ulap at the Pinoy Mountaineer blog here. The website has additional details about the mountain. It's important that you check it out because it's written by an experienced and professional climber. You should also check out the map of the traverse to get an idea about the terrain. And of course, if you still have questions, you can get the contact number of Ampucao's tourism office. Pinoy Mountaineer listed the office's cellphone number as 09989589549.